Google’s Chromecast is the perfect device for a lot of people, allowing you to stream content to your TV. Its cheap price and user friendliness is what allowed it to sell so many units. 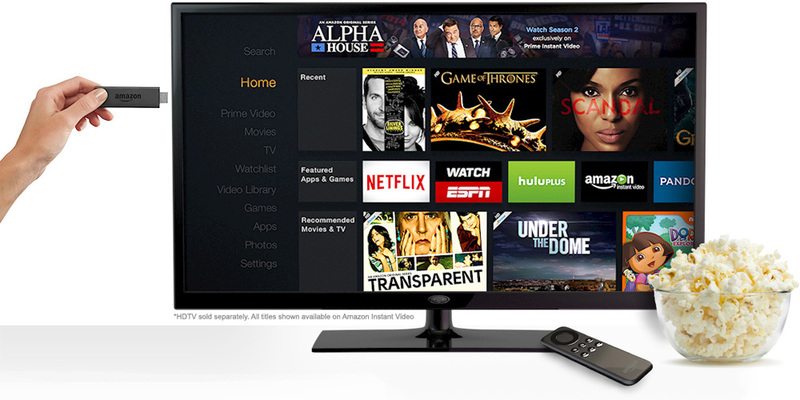 And now Amazon wants a slice of that cake and hopes to win it with the Amazon Fire TV Stick. The Fire TV Stick is definitely no the best named streaming device out there but it shows some promise and may even give Google a run for its money. Amazon has Google’s Chromecast beat on the hardware end – it has a dual core processor, 1GB RAM, 8GB storage and costs just $4 more than the Chromecast. Amazon also flaunts Dolby Digital Plus surround sound and dual band, dual antenna WiFi which should result in smoother streaming. The Chromecast on the other hand is lagging behind with half the RAM, 2GB storage and a single core processor. But if specifications were everything, people would be lining up for the Fire TV Stick already (they could have also been a little more creative than calling it a stick). The fire TV Stick is really similar to the Chromecast, it’s basically a dongle you connect to the HDMI port, plug in the power and start streaming. The company is also offering a remote with the device with which you can control basic media playback and even play some games, albeit restricted in terms of flexibility of playable games. They are even selling a remote with a mic for voice control for $29.99, although the exact same tasks can be executed directly from your Android phone or tablet. One reason for the Chromecast’s success was its openness and lack of restriction. Amazon as always is looking to use the Stick as another way of getting people into its ecosystem. Provided you are already a part of it and are subscribed to Amazon Prime, this deal is great. Amazon has a boatload of content and is also offering some of the big names in streaming with it. On paper, the Fire TV Stick looks to be a solid entry into this market but with rumours from the past months predicting Google launching a refreshed Chromecast soon, prospective buyers may seek to wait before jumping the gun. If you are invested in Amazon, by all means opt for the Stick. If you are not as enthusiastic about diving into their ecosystem, wait a while.